Fighter, herald, confectioner, costumer, and cook. Baroness by the grace of King Lucan von Drachenklaue and Queen Jana von Drachenklaue. Donatary of Duchess Kiena Stewart,Fighter for the honor of Duchess Anna Ophelia Holloway Tarragon. Alesone Gray, is the daughter of a successful London grocer that made a sizable donation to the crown and received a Knighthood. She grew up in Cranlegh village, Surrey, England, as the youngest sibling with five older brothers, in the later part of the 16th century. She was taught dancing at an early age, by the master hired to teach her brothers fencing. She would secretly watch the fencing lessons, longing to play with the blades. After being caught on numerous occasions with weapons in hand, her father allowed her to take lessons with her brothers. She eventually cajoled her father into allowing her to be trained to use black powder and cannons. Having completed her apprenticeship in her father's grocer's shop, she paid her Guild fee and is now a full livery member. 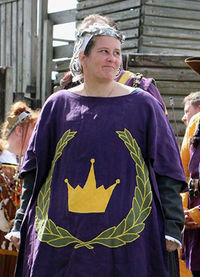 http://sugarwricht.wordpress.com/ "Here begins the nyce and trewe accounte of Alesone Gray of Cranlegh, Sugarwricht. This booke of secrets shall endeavor to record my journey as I learn the skills that would have been needed to become a confectioner in a large noble household in 16th century England. Since confectioners were part of the Grocers, this is the my model for skill discovery and execution. At the end of the journey, I will have my own book of secrets, that I will be able to pass on to others like me, who share a love for confections." http://alysten.wordpress.com The bulk of my general SCA research, classes, projects, recipes can be found in my project journal. Included are my experiments, successes and epic failures. I have a more focused Grocer's Confectioner blog. http://rapierpanda.wordpress.com This will follow my journey to learn more about Spanish Rapier, in the traditions of Destreza. I started down the road of Spanish rapier 2 years ago and I haven’t looked back. This is where I plan to keep all my drills, documentation, experiment successes and epic failures. This is my thought library, the good, the bad and the what was I thinking. This page was last edited on 18 March 2018, at 23:20.